I want to help you preserve every moment that is meaningful to you! From the excitement of your engagement to the day you walk down the aisle. The expectations of pregnancy to the joy of bringing home a new baby. All the stages your little bundle goes through during that first year and every year after that. Family portraits, extended family portraits, special anniversaries, graduation... Jungling Photography creates images that stop time and tell the story that is uniquely yours. 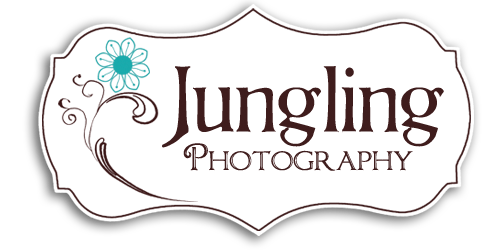 What is a session like with Jungling Photography? When you call to book a session, I begin my planning. I will ask lots of questions to help me understand exactly what your desires are, how you plan to use the portraits and how that vision will work as decor in your home. Sessions are very relaxed and fun. I take my time getting to know the subjects and making them comfortable with me so that we are all pleased with the outcome. Payment for your session and any add-ons are due at the time of scheduling. The sessions generally take 45 minutes to an hour, sometimes less, sometimes more. I always allow time in the schedule so we can work as long as we need to get what we're after. Newborn sessions tend to take a little longer if we need to take a break for a feeding or diaper change. I plan on being with new borns for at least 2 hours. We're not always going for a smile, sometimes we want those serious, sweetly quiet, or even mad expressions. Even if your child isn't having one of their best days, we can usually catch some great shots before the end of the session. You can also expect to see some of the pictures as they are shot during your session. Most importantly, we want the session to be fun and relaxed. We want to play and giggle and create some special moments that we just happen to catch in the camera. How long will it take to get your proofs and prints? Proof viewings are scheduled for about one week after the session for regular sessions (Weddings and Seniors take about 3 weeks). The viewing is held in studio. We will look at all of your proofs together and I can help you decide on sizes, groupings and framing options so that your images will fit in your home as timeless treasures. It helps if you come with some ideas of where and how you wish to display them in your home and who you will need gift prints for. Print orders are sent to our lab on Tuesdays and take approximately one week to arrive. Jungling Photography strives to offer you the absolute BEST product possible. We work with an incredible lab whose standards are hard to beat so that each print, enlargement, gallery wrap or album that goes home with you will be as beautiful tomorrow as it is today. Larger prints are mounted on matte board so that they will stand the test of time and are gauranteed for life. Being pregnant is such an amazing time! So much hope and happiness. Not everyone wants to bare their expanding midriff, which is just fine, but don't let that stop you from capturing the excitement of the new life that is starting! Wear something that shows how you've blossomed and be as modest as you feel comfortable. These sessions are even more special when Dad and older siblings are involved. I like to schedule belly sessions for about 34-37 weeks gestation so that we get the full effect and are sure to get them taken before Baby arrives. As a mother of twins, I am very familiar with the possibilities of bed rest and early delivery so if you're expecting multiples, we'll try to get your session scheduled a little earlier. The wonder of a new baby is best captured in the first 5-10 days after birth. They are still bendy and squishy and your hearts are still brimming with emotions. I like to capture some family moments so everyone can expect to get in on some pictures. Babies often need some breaks for feedings and we want to be sure we get some pictures of them completely sacked out. For those reasons sessions can take 2-3 hours. My favorite baby pictures are nudes but if you have a special little hat or blanket, they can add great texture and character to the pictures. Your wedding is a day that you will always remember, so special! You should have wedding portraits that are just as special. Trust us with how you remember that day for the rest of your life. Angie and an assistant will take great care in making sure you get those romantic portraits that really show just how in love you are! We have packages sure to fit your needs and can even customize a package for you. Proofs take about 3 weeks to carefully edit and prepare for your viewing. They will then be available online for proofing and sharing with loved ones as well as a private viewing with the photographer when they are ready. Coffee table books, gallery wraps, announcements and thank you's with your portraits are also available. Call today for your free consultation! Contract and retainer are required to reserve your date. Your senior year is an exciting time in your life! Your portraits are how your classmates will remember you for years to come. How do you want to be remembered? We meet with each senior before their session to get to know them a little and get a feel for how they envision their pictures. You can change clothes as many times as you like. We do a studio session and up to 2 off site locations, spending about 3-4 hours together and you can expect to see a few shots as we go. Parents are welcome at both the meeting and the portrait session. Jungling Photography can also design your announcements and invitations using your favorite images.